We repair all brands of residential clothes dryers, gas and electric. Clothes neatly folded. 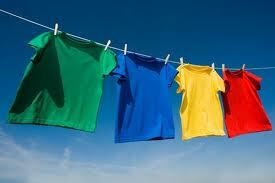 Shirts pressed fresh and wrinkle free having the scent of a spring day. These are the results of a properly operating clothes dryer. We fix all brands, gas and electric. Dryers work as the result of three basic things. Those three things are heat, tumble, and air-flow. Heat- Does the dryer get hotter than room temperature? Regular/heavy/cotton setting runs at a temperature of 150 degrees F. Permanent press is 135F. Gentle is 120F. Tumble- Does the dryer drum go around or tumble? Air-flow- Very important and often overlooked is air-flow. This carries the heat and humidity out of the clothes and to the outside of the building. Without proper 4 inches of air flow through the exhaust pipe, your clothes will take too long to dry. Lack of sufficiant air-flow also causes rapid wear and tear to dryer components. Check air-flow by going to the outside of the building while the dryer is running and feel how much wind is blowing out of the exhaust vent. Also watch for crushed duct material behind dryer.